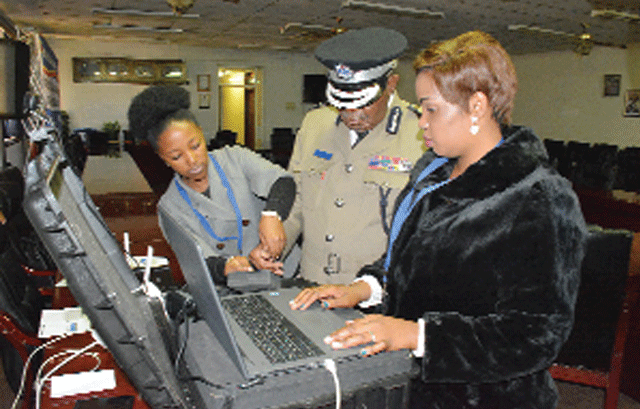 The National Commissioner of Police Isaac Magagula has led by example and registered for the national elections while also encouraging police officers to register to vote. The registration process which commenced on Sunday is conducted in centres all over the country in preparation for the 2018 elections. Making his remarks at the police headquarters conference room yesterday, Magagula said officers had been encouraged to register so that they can exercise their right and vote for candidates of their choice. “If police officers stay away from voting they will have no one else to blame but themselves when their preferred candidates do not make it during the elections. Members of the RSPS will be given a special provision for registration which will be brought to them during working hours,” he said. Magagula said lists would be consolidated and the officer’s names would be forwarded to the relevant chiefdoms and constituencies where they will be casting their votes. He went on to register so he could be eligible to vote in the upcoming elections and was issued with a voter’s card. Other police officers based at the headquarters also got an opportunity to register with the assistance of officials from the EBC.